Visual minutes and group doodles involve pens, big pieces of paper and people. Also known as graphic recording or facilitation, when used at meetings and events it can enable innovative thinking and effective communication between individuals and groups. It encourages people to be dynamic and think about information in pictures. This supports better engagement with topics by creating accessible visual summaries that are quick to digest. Typically how it works is that a visual minuter attends the meeting or event and, on big bits of paper draws what people are saying, capturing the mood and themes arising. If the visual minuter is facilitating the event, they will encourage participants to draw with them and contribute to the image by engaging them in activities and tasks. At the end of the event the visual minuter will talk through the image and summarise the content of the day. The image produced can then be used as a record of the event. 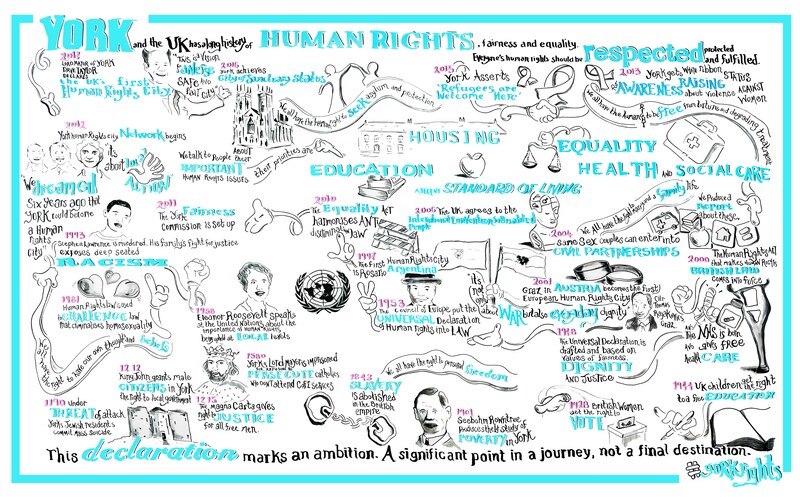 Here is an example of some visual minutes created at AgeUK York’s recent AGM as well as a time line for the York Human Rights City Launch. Group doodles are a participatory and inclusive method for capturing ideas and information. Being low tech and low cost, people can get involved easily which and shape the debate visually, which gives people a sense of ownership and shared understanding. While the image is seen as the end result, the process that participants go through to create it is a product in itself. Through participation, group doodles can capture detailed insight of user journey’s, community experiences, research data, and other information. Once visualised, the image summary can be used to inspire infographics, data presentations, easy read documents, shared as a visual record or pinned on the wall in the office as a memory aid and facilitate further debate. 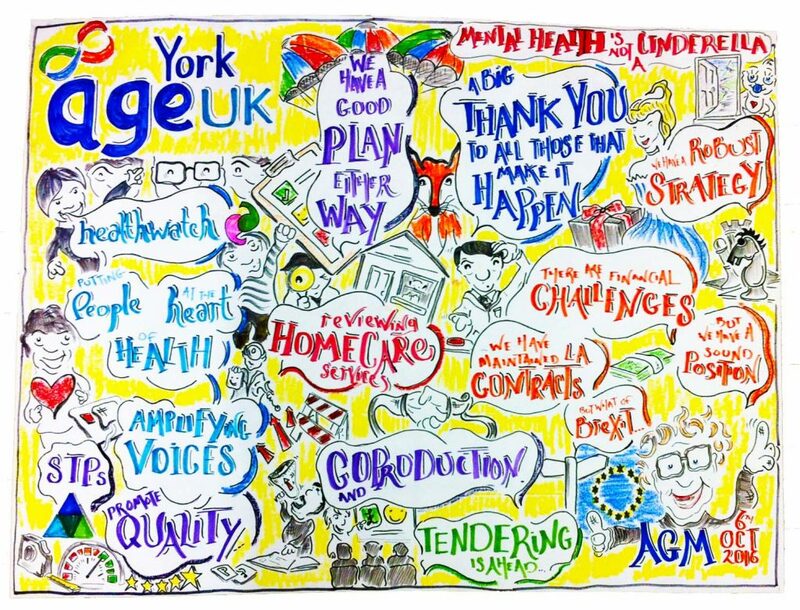 An example of this is the York Disability Doodle, which the following video summarises. Created in 2015 at York St John University to coincide with disability history month and international day of disabled people, staff, students and visitors were encouraged to share thoughts and experiences about disability. Please contact me to explore how you might use visual minutes and group doodles in your work.